After a full day of work and after-hours activities, sleep should come naturally, right? 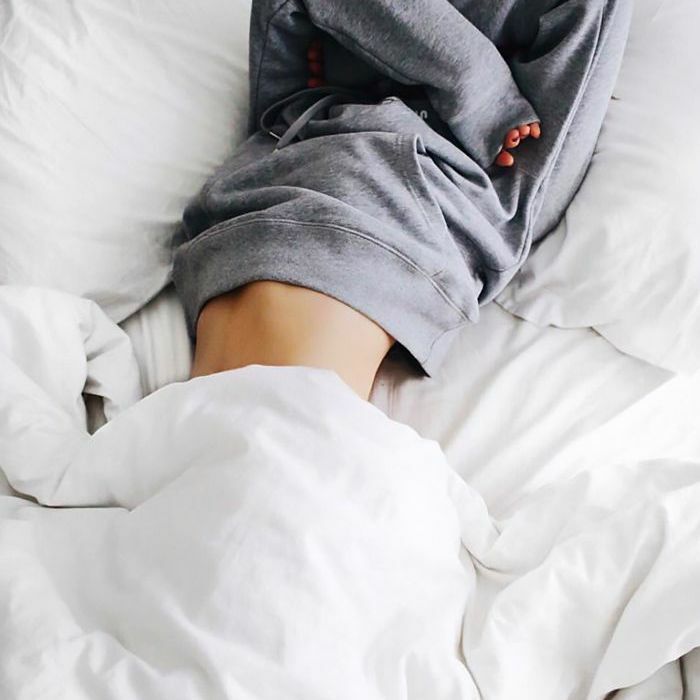 Between meetings, deadlines, work lunches, countless cups of coffee, and maybe even a trip to the gym, come 10 p.m., we're more than ready to jump under our covers. Mentally, we're exhausted, so why is it that we find ourselves restless and (still) awake into the wee hours of the morning? According to Amy Opielowski, senior manager of quality and innovation for CorePower Yoga, stiff and aching muscles could be to blame. Luckily for us, there's a quick (and blissfully relaxing) solve: stretching. With a little bit of strategy, certain positions and movements can help you stretch your way to a better night of sleep. The reasoning: They'll help open up your body, soothe your neuromuscular system, reduce stiffness, and help you relax before climbing into bed, Opielowski tells us. These stretches also encourage circulation, which boosts oxygen into the bloodstream and in turn discourages apnea (which can lead to a restless night.) Today, Opielowski (who has specialized in yoga since 2007) offered to walk us through the five stretches she recommends most. Our response: Om, yes. Keep reading for the best sleep-inducing stretches to do before bed. "Start on your hands and knees and step your right foot to the outside of your right hand. Slide your left knee back so that your knee is behind your right toes. Reach your right arm up and twist your torso to the right. Kick your left heel towards your glutes and grab the pinky toe side of your left foot (use a strap or towel for support)." Hold the stretch for 60 seconds and then switch sides. "Lie down on your back, and stack your heels under your knees. Cross your right ankle over your left knee, and flex your right toes toward your right shin. For more sensation, pull your left knee in toward your chest and interlace your hands behind the left thigh." Hold this stretch for 60 seconds, and then switch legs. "Pull your [yoga] mat up to a wall. Lie down and move your side hip all the way up to the wall. Roll onto your back, and extend your legs straight up the wall." Expert tip: Try placing a bolster or blanket underneath your lower back for a little more support and additional comfort. Hold this stretch for one to two minutes. "Lie down and pull both knees into your chest. Extend your left leg long and extend your right arm out at shoulder height. Draw your right knee over to the left until your right hip is stacked over your left hip. Ensure your right upper thigh is in line with your hip." Expert tip: For more support, try using a block or blanket underneath your right shoulder and right knee. Hold this stretch for 30 seconds, and then switch sides. "Set a soft timer for two to five minutes, and rest. Place pillows or blankets under your knees for more comfort." Though savasana, or Corpse Pose, isn't exactly a stretch, per se, it's a vital step when it's time to de-stress and relax your muscles before bed. By lying on your back, you allow muscles to release the tension they've been carrying throughout your day. Next up, the best places to get your zen on in New York City.